Minomuck - An alternative to Scalpmed. Minoxidil an FDA approved treatment for male and female type hair loss. However results are usually less than desirable. This is because minoxidil actually does nothing to reduce DHT, the hormone responsible for causing the condition. If we add certain compounds to minoxidil to reduce DHT the results could be significantly better. "Minomuck" is minoxidil (either 2% or 5% minoxidil) with beta sitosterol and saw palmetto added to it. It is very simple to make. I supply the concentrate. You purchase a bottle of minoxidil locally. Next you measure out 10 mls of the concentrate and add it to the bottle of minoxidil. Then you simply follow the application instructions that you receive with your bottle of minox. Unfortunately it is impossible to locate a small supply of pure beta sitosterol powder to make it by yourself. You can purchase capsules however these contain magnesium stearate as a filler. I fear that this filler could very well render the minoxidil inert and completely ineffective. The only way you could make it yourself is if you first purchased a very large supply of pure beta sitosterol from a manufacturer. Furthermore making the liquid saw palmetto/ beta sitosterol is not as simple as the other formulas. To make a years supply on your own would cost more than if you just purchase the ready made liquid and simply add it to your bottles of minoxidil. This formula contains what I feel are the active ingredients in the popular infomercial product known as Scalp Med. Scalp Med contains other ingredients besides saw palmetto and beta sitosterol. I personally doubt these other compounds could have any benefit applied topically. Furthermore Scalpmed is damn expensive. The last I checked it will run you around $90 a month. Minomuck will cost a great deal less. There are three active ingredients in Hair Muck. They are saw palmetto, beta sitosterol and polysorbate 80. Let’s start with saw palmetto also know as Serenoa repens. Here’s the results from one study for topically applied saw palmetto. But there are other studies out there. “The results, evaluated clinically and by laboratory tests, showed a significant (p< 0.05) 35% hair increase both on number and mass, and a contemporary 67% decrease of (p< 0.05) superficial sebum in the 1st group. Group 3 reveled a hair increase of 20% (p< 0.05) with a contemporary decrease of seborrhea (35% p< 0.05). Group 2 had no results. Now to understand this study you need to understand that "5a reductade activity" or 5AR is the precursor of DHT. 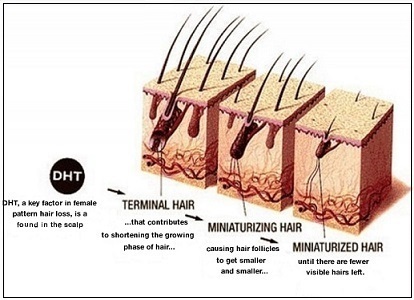 If you reduce 5AR, you reduce DHT which is the hormone responsible for causing you to lose your hair. The active ingredient in saw palmetto causing this reduction in 5AR is known as beta sitosterol. This is the second ingredient in Hair Muck. In theory this should make a topical formula that contains beta sitosterol many times more powerful than saw palmetto alone. The third ingredient is polysorbate 80. Polysorbate has been out since the 70’s. It is no miracle treatment but we also have scientific studies demonstrating it’s efficacy as well. It is also believed to work by reducing DHT. Hair Muck also contains glycerin. Although there are no studies demonstrating any benefit to hair loss sufferers it does lessen the common scalp irritation people often get from using a standard minoxidil product. The price of the liquid saw palmetto/beta sitosterol (I call it "Hair Muck") is $34.95 for enough concentrate to add to 12 bottles of minox. This should last you approximately one year. You can purchase 3 bottles 5% minoxidil at Walmart for $19. The total cost should average out to be roughly $11 a month (assuming you use one bottle of the minox a month). Click here to order Hair Muck for making Minomuck. Once you have a fresh bottle of minoxidil and the liquid saw palmetto/beta sitosterol (Hair Muck) you are ready to make this simple formula. 1). Open your fresh bottle of minox. 2). Using the plastic measuring cup, pour out 5mls of Hair Muck and dump it in your bottle of minoxidil. 3). Close container of minox and shake well. Apply it to all areas you wish to treat. Apply it after showering and then approximately 12 hours later. 4). After a few days of applying your Minomuck you can again measure out and add another 5mls of the hair muck. The reason why you couldn't add all 10 mls initially is because the container of minox would overflow. 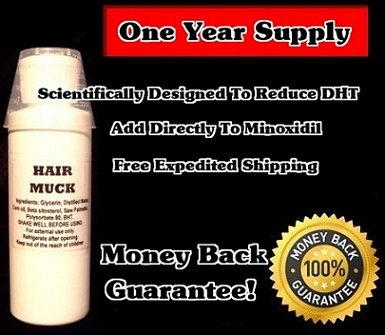 After a total of 10 mls of Hair Muck has been added to your bottle of minoxidil do not add anymore. When your bottle of Minomuck is finished simply repeat these instructions using a fresh bottle of minoxidil. 5). Make sure you refrigerate the Hair Muck after opening. When it is time to make more of the brew, make sure you remove your Hair Muck from the refrigerator and allow 2 hours for the Hair Muck to warm back to room temperature. Then shake well for one full minute before using it to make more Minomuck.